There are loads of bakeries in Seoul, and it's possible to get decent bagels and french baguettes, but there are also some pretty dodgy pastries on offer, mixed with bread filled with cream (not mozarella, a mistake to be made only once). But what Seoul's bakeries lack are proper cakes, fairy cakes, cupcakes, eccles (yummy!) so I was pretty chuffed with little find in Hongdae. They only had about 5 variations, we had double chocolate and mocha flavour. It's a regular cafe too so you can get a coffee with your cake. 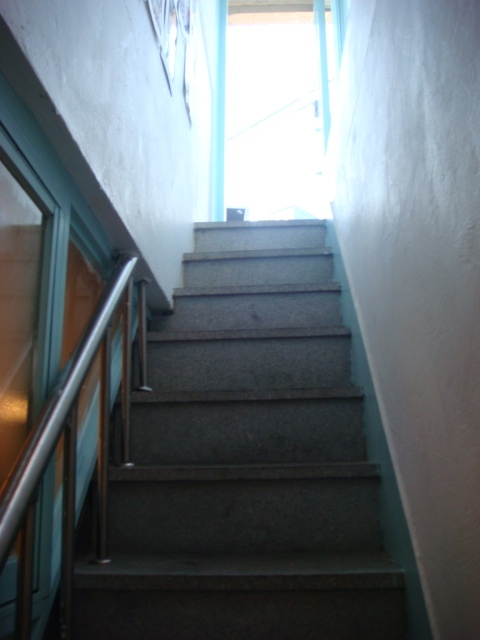 It's only a small place, and you have to walk down a narrow staircase to reach it, don't eat too many cupcakes - you might get stuck getting out - but it was a unique stumble upon in Hongdae (continuing on my visit hongdae during the day resolution). FYI: To reach the cafe, leave Hongdae station (Green line 2) at exit 8, turn immediately right and walk along to the junction. Turn left and keep walking, past the next junction (which looks a bit like a roundabout) and the cafe is on your right.